Now this image will give you the understanding. 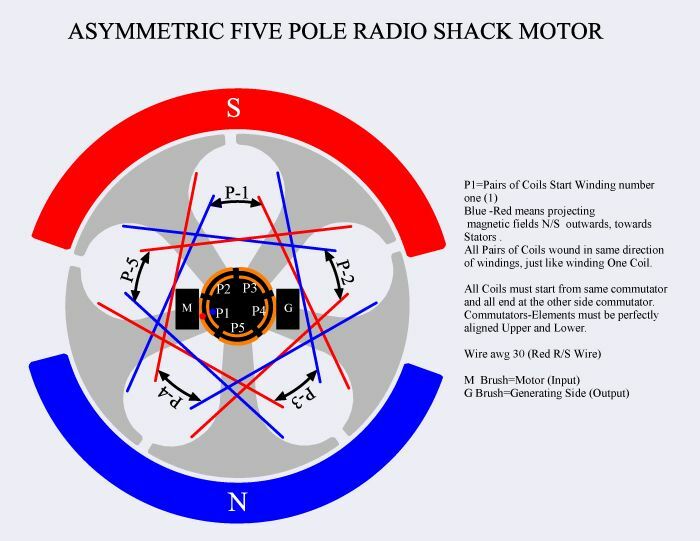 However, when showing this plan view, I reduced the lower commutator and there are not shown the lower brushes ..it will create confusion, but you all know they are "crossed in diagonal" on this motor, as my video Part 1 explains it. So Output Negative would be the "G", and the one shown on left "M" would be Positive Motor (Input). You just wind Pairs of Coils as You just do a Coil, continuously, except going through the angle of the Armature Core, just like a "Bent Coil" in V Shape. Now please, this tends to confusion, because once you start winding, you could loose where was your starting point...so, please mark it with a tape on shaft or permanent marker, the side chosen to start all coils.